A Dragon’s Palace? 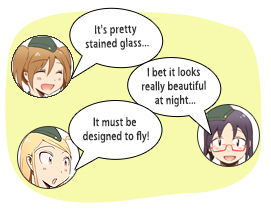 No, it’s a Shrine. A building of indescribable cultural fusion. It’s as if it’s right out of a fairytale. Kanazawa Castle is located in the middle of Kanazawa. To the west of it, however, is a strange building. The third layer at the top of this chinese-style stone structure is decorated with western-style stained glass. A little reminiscent of the Dragon’s Palace fairy tale, this is indescribably bizarre in appearance. And in front of that, no matter how you look at it, lies a purely Japanese Shinto gateway. Yes, this strange building is the entrance to a shrine. 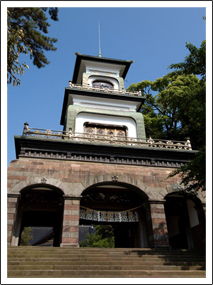 Named Oyama Shrine, this respected and honored shrine is dedicated to Toshiie Maeda, the founding lord of the Kaga Province. For this volume of Kanazawa Life Map we attempt to thoroughly examine this shrine’s charm and magical landscape. Toshiie Maeda has been enshrined at Oyama Shrine. This feudal lord laid the foundation for the Kaga Domain. We’ll attempt to talk briefly about the details of his life. 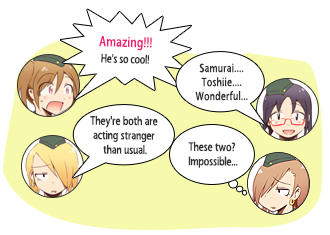 In 1539, during the midst of the Sengoku(Warring States) period, a small clan had their 4th son, Toshiie. After his coming of age ceremony he served Oda Nobunaga. His valor emerged and he was eventually granted lordship over Noto. After Nobunaga’s death, he served Toyotomi Hideyoshi and was given control over both Etchuu and Kaga provinces. At the end of Toyotomi’s regime, he was second next to the leading feudal lord, Tokugawa Leyasu. Even at a young age he was feared, with the nickname of “Mataza of the Spear,” due to his virtuoso spear skills. Under direct control of Nobunaga, he served as the head of the Aka-Horo-Shu, a special red cloaked force used for marking positions and progress on the battlefield. The cloak, when expanded, can protect the wearer’s back from arrow attacks as they ride across the battlefield. Because of its bright red colors distinguishing it on the battlefield, this is a very dangerous position to hold. Therefore only one who is trained in wearing the special cloak can be allowed to wear it. Toshiie was also known to carry a spear measuring more than six meters in meters in length. A typical spear is about two meters, so that’s more than three times normal length. Toshiie wore a golden catfish shaped helmet. Toshiie was Saved from a Ruined Shrine. Once inside, there’s a normal, splendid shrine. Toshiie died in 1599, late during the Azuchi-Momoyama Period. 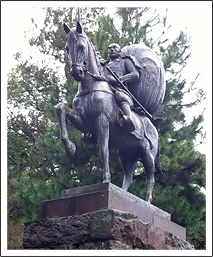 His spirit was enshrined in Utatsu Hachimangū to the east of Kanazawa Castle. However, at the beginning of the Meiji Period decent, the Utatsu Shrine would be completely devastated by the turmoil of the Imperial Restoration. Unable to remain inactive at such a sight, the former Maeda vassals and others planned to build a new shrine dedicated to Toshiie. 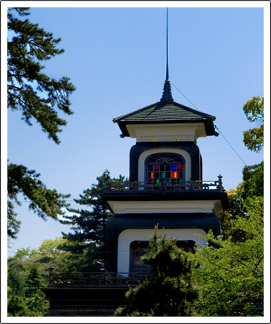 In 1873, Oyama Shrine was built near the west side of Kanazawa Castle. However, at this point, it didn’t have its unusual appearance yet. It was originally a normal shrine. A Combination of Chinese, Japanese, and Western Styles Makes for a Very Bizarre Shrine Gateway. There was a desire for the Oyama shrine to be built. 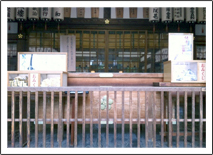 However, because of changes in the state of society since the Meiji period, it was not easy for worshipers to gather. So, two years later, in 1875, the shrine was built. The unusual shrine gate was built with the purpose to achieve an increase in worshipers. The Chinese style pavilion was decorated with Western style stained-glass windows. After stepping through the Western style brick pedestal, a Japanese style wooden beam carved depicting a crane and a pine tree can been seen. Considered “ugly” at the time of construction it was the voice of notoriety, but early in the Showa era, in 1935, its value was recognized and it was designated an important cultural property. Once through the Western style brick pedestal, there’s a Japanese style rope and transom. A spire towering over the top portion is not just decoration. It functions as a lightning rod. At the time, it was built according to Dutch medical advice and has since then become Japan’s oldest lightning rod. Western style stained glass sits atop this three layered Chinese style pavilion. The gardens are reminiscent of the previously introduced Kenrokuen Garden. 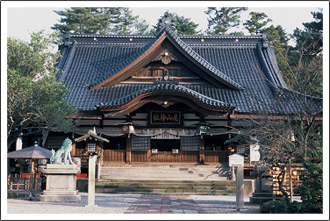 Built during the early Edo period, its history is older than Oyama Shrine. 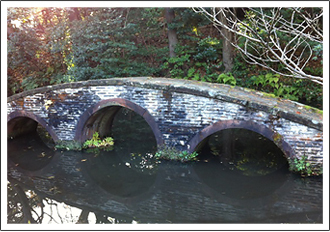 In particular, highlights include the beautiful, triple arched, Tsuki Bridge. In fact, it is known that the shrine gate’s design is on based this. This bridge can actually be crossed over. Feeling a little athletic? Appreciation and Gratitude is the theme behind this bronze statue. 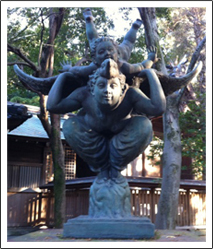 In a way, this bronze statue has more impact than the shrine gate. It was built in 1981, late in the Showa period, by sculptor Toyama Hirano and the Japanese Eternal Youth Association. 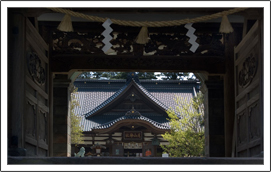 Since so much artistic design was allowed, it shows that Oyama Shrine is extremely tolerant. 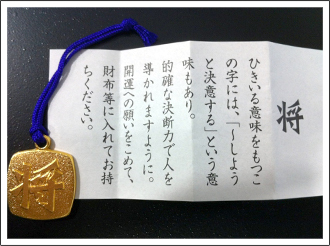 Pertaining to shrine fortunes, Oyama Shrine’s fortunes are a little different. One can draw from seven types of fortunes. We took one of the men’s fortune. And the result… not bad. “Knowing one’s own place is wise self defense.” Sorry for the mediocre results. From left to right, men’s fortune, women’s fortune, health fortune. The men’s fortune comes with a one word message. The single character represent the person who drew it. We introduced a variety of topics above. These might appear to be completely separate facilities. 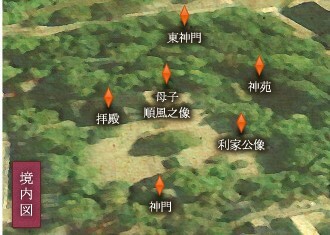 However, all this has been condensed into the limited space that comprises Oyama Shrine and its grounds. Aside from being introduced here, various events have been carried out over time at Oyama Shrine, from festivals to contemporary art exhibits. Oyama Shrine continues to override the existing image of what a shrine is. Keep an eye on it!